Former Miss America, Dr. Shirley Cothran Barret, has been entertaining and energizing audiences with her transparent and humorous candor for over 40 years. Using her life experiences, she motivates, encourages, and edifies her listeners to examine their present and future destinies. Shirley has an earned doctorate degree in education from Texas Woman’s University and is a contributing author to various publications, as well as pursuing personal goals in other arenas of creative writing. She is a member of National Speakers Association and has served on several boards such as MADD, Texas Speedway Children’s Charity, and her local school board. She has appeared on telecasts such as Good Morning, America, The Today Show, and other numerous talk shows. Always considered a shy person growing up, she never expected to someday walk the runway in Atlantic City to the crooning of There She is, Miss America! 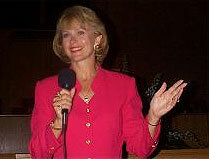 But, that is exactly what happened, and Shirley found herself speaking and performing in front of audiences ever since. Whomever the audience, Shirley has discovered thousands of people who are curious as to what a Miss America might have to say that will help, enlighten, and relate to them. Shirley and her husband since 1976, Richard Barret, live in Texas and are parents to four grown children and three grandchildren. Life has given Shirley a wonderful and varied base of experiences with which to touch lives to those to whom she speaks. Perspective personified is what Shirley offers to her audiences!